Want to Learn How to Dance? 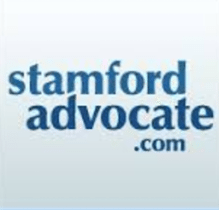 Need dance classes in Fairfield County, Connecticut? Salsa, Tango, Hustle, Swing, Waltz, Rumba, Whip & Nae Nae… you name it… we’ll teach it! At our Stamford dance studio we offer private dance lessons, group dance classes, and create unique experiences at our events. You’ll be dancing confidently in no time! You don’t need a partner or any previous dance experience! Our friendly & knowledgeable dance instructors have multiple teaching certifications including National Dance Council of America, Imperial Society of Teachers of Dancing, DVIDA, and Roll Call Wheelchair Dance. 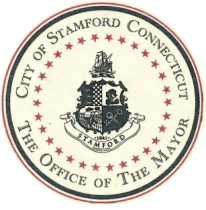 We serve the entire Stamford area including Greenwich, Trumbull, Old Greenwich, New Canaan, Norwalk, Darien, Milford, Weston, Westport, Connecticut Rye, NY, and welcome dance students from everywhere! Ask About Our Introductory Specials! Dance With Me Stamford opened its doors on April 16, 2012. 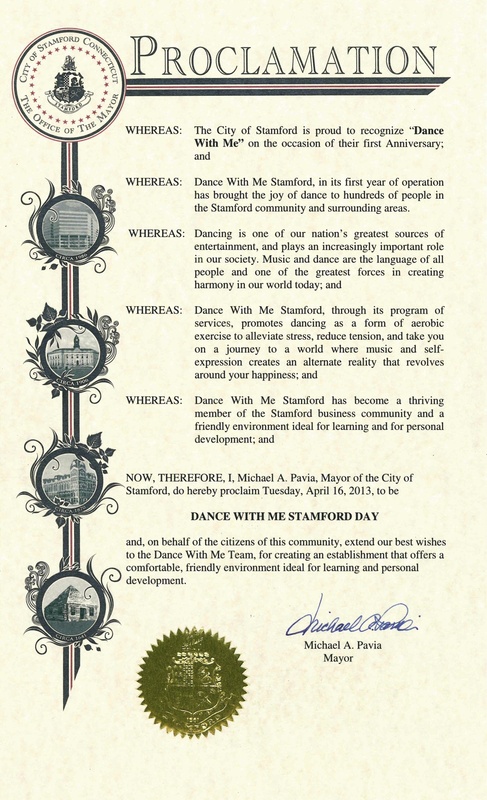 Mayor Michael Pavia proclaimed April 16, 2013 to be Dance With Me Stamford Day, and the proclamation reads as follows.“Dance With Stamford, in its first year of operation has brought the joys of dance to hundreds of people in the Stamford community and surrounding areas (Fairfield county). The entire Dance With Me family is devoted to your success at every level. Dance With Me Studios are the perfect combination of rigorous programs and fun teachers who create an encouraging atmosphere where you will gain confidence and grow. Dance With Me instructors are committed to developing an individualized experience where you are guided every step of the way, at your own pace. Experience the magic of ballroom dance and its unparalleled ability to enrich your life. Let’s take your love of Rumba to the next level! Need to practice your dance patterns? This is the class for you. This class is designed to help students become stronger dancers. It’s a perfect refresher before our Social Party. Come practice all your ballroom dance moves at our social dance party! Your Friday night just got hotter! Come learn in this popular social dance. From fun turns to fancy footwork you will defiantly be a hit on the dance floor! How can we make you happy? Let us know if you have any questions or if you would like to try an introductory lesson to get you started on the right foot! Sasha started dancing at the age of twelve after watching his first ballroom competition. Ballroom and Latin captivated him he spent the next 18 years studying them. He trained at the Belarusian State University of Culture and Modern Art where he majored in Ballroom and Latin styles and teaching technique. After graduating, Sasha traveled all over Europe and Asia performing and competing in many different venues. He has been highly ranked in multiple national and international championships. He is also a Pre Master of Sport awarded by the Belarusian Federation of Dancesport, a finalist in IDSF Ranking Championships, and has had featured roles in numerous musical productions and TV shows. Sasha is a true showman who loves demonstrating the character of each dance whether on stage, or on a lesson. David Thomas Moore is the Artistic Director and resident choreographer for Dance With Me USA. He is particularly known for his signature style of choreography based in the rapidly emerging “ballroom fusion” genre. His work has been featured on television and stage and has been awarded at competitions throughout the country, as well as the world famous Blackpool Dance Festival in Blackpool, England. He is the co-writer, choreographer, and director for Dance With Me’s break-out original stage production, Sway: A Dance Trilogy. David also serves as an instructor at his Dance With Me home in Stamford, CT.